It seems everywhere you look in craft land, all you see are videos and posts on the new Ranger Distress Oxide Ink. I initially held off on the mania, not sure if I wanted to commit to yet another ink. However, after seeing a few videos demonstrating them, I became hooked. Last year when the Distress Crayons came out, I didn’t see a use for them that wasn’t already being met by other media. And a couple months ago, when I finally broke down and purchased a starter kit with a 60% off coupon. Playing around with them, I was glad I didn’t pay full price. However, everything I saw with this new Distress Oxide ink inspired me to try them for myself. It took a few weeks to be able to open them up. I found them at my local craft store on sale, and then marked down even further on their Tuesday night 20% off happy hour sale. They were a great price so I grabbed one of each of the colors, knowing I usually end up with Full Set Syndrome. But as I went back to the car excited about my purchase, I found my beloved dog had collapsed in the car and we rushed to the emergency room. The inks sat in the corner, a sad reminder of that night. It’s finally time to pull them out and see what all the excitement is about. I wanted to use them on an upcoming Mother’s Day card, and was interested to see how they react with different types of paper. I’ve accumulated a few types of watercolor paper and wondered which would be the best for the base of my card. I have used the Ranger paper and the Skills paper on projects in the past and haven’t been a big fan of them. They were not conducive to moving color around like watercolor paper should. Even worse, the Skills paper would pill if too much water was added or with repeated brushwork. I have a pad of Arches paper somewhere, but was unable to find it in time to do this video. I’ll be curious to see how it stacks up and may do a follow-up post if I get notable performance. The interesting thing with all of the papers was that the colors kept melding down to a pink color and did not retain their uniqueness. In other videos I’ve watched, it seemed that as you added layers then added water sprinkles, the prior layers rose to the surface. Perhaps I need to go back and watch them again (never a bad way to kill some time! ); but I did not have that same experience. They pretty much all melded to a pink color, even though the Marmalade would burst through where spritzed with water. Once dried, they still averaged back out to pink. Second observation is the unique and almost indescribable texture the Distress Oxide ink brings to the surface. Smooth, almost chalky, almost like venetian plaster. Unique! Third, I was surprised by the results of the various papers. I was not a fan of the Ranger paper here either. As you can see from the close-up picture, the texture of the paper became all wrinkly. It also absorbed the ink too much and you didn’t get the oxide reaction when water droplets were sprayed on. My favorite was made using the Mixed Media paper. In addition to having a smooth white surface, it tends to react well when water is added to it. The spots where water was sprinkled on and the oxide bloomed showed up very nicely. I was pleasantly surprised that I liked the way that the Skills paper reacted. By far out of all the samples, it displayed less arching when water was added to the top and it maintained its texture well. 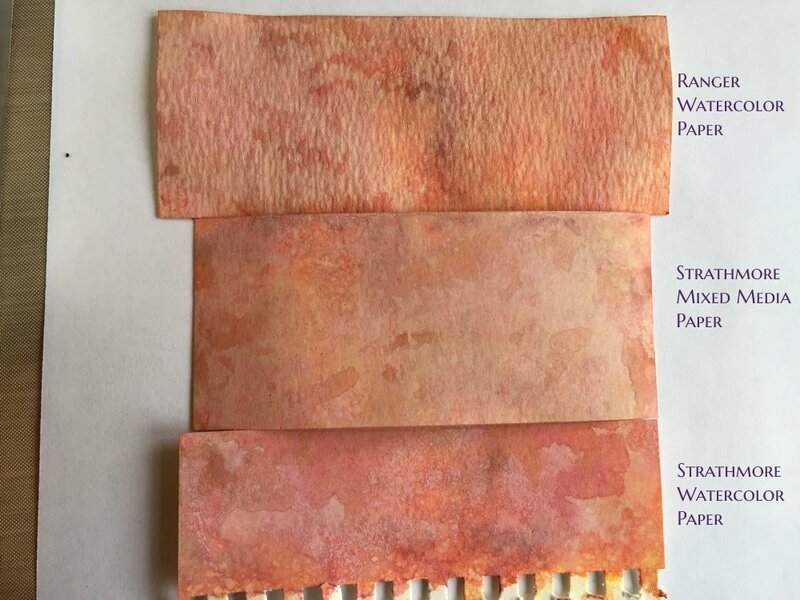 The colors did not have as much of the oxide reaction, and the colors melted into the paper more than the Mixed Media sample. Overall though, it turned out a nice usable sample. Using these inks with this paper may be the way I can go through the supply that I have, since I won’t use it for regular watercolor painting. 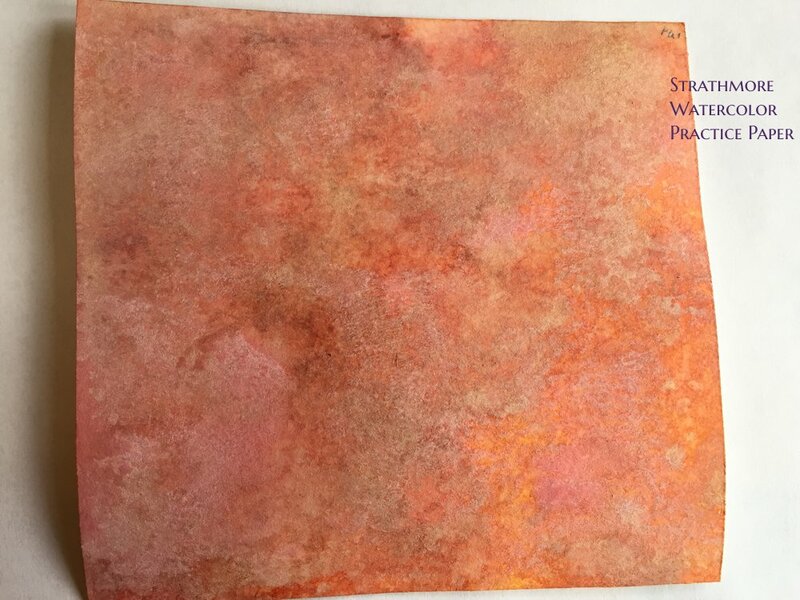 The standard Watercolor paper worked well too, and did keep some of the oxide reaction on the top of the paper. 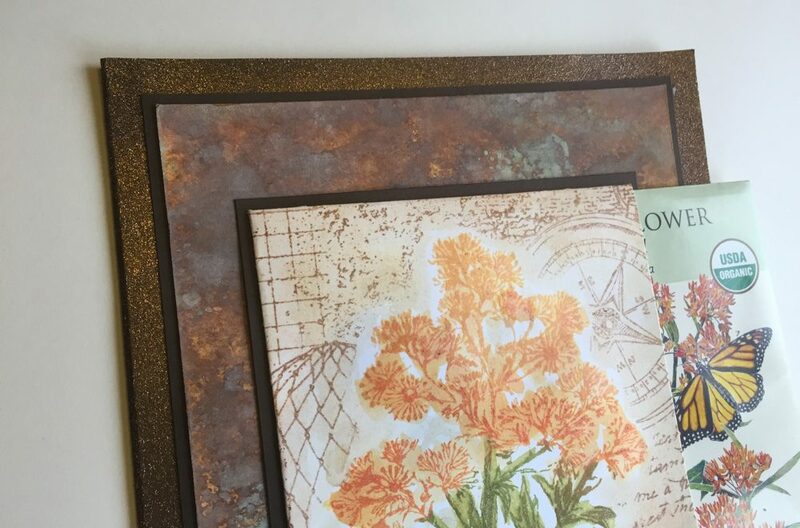 In the pictures here on the website, it appears this paper has the best display of the oxide effect. It must be the camera work, in real life this sample doesn’t show this well. Overall, I think I’ll get a lot of use out of my collection of Distress Oxide ink. 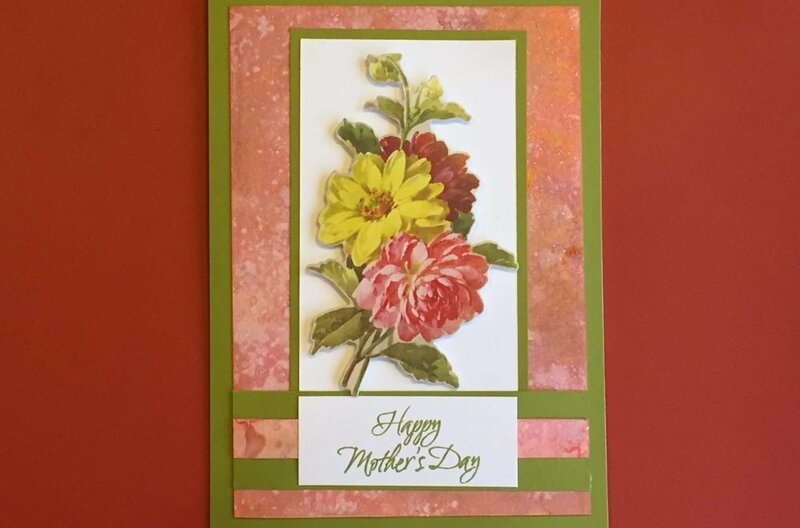 In fact, come back next week for my next post where I use the results of today’s experiments to create a beautiful Mother’s Day card.